MIKIPEDIA HEALTH BLOG: GEOENGINEERING AND BIOENGINEERING: "THE WORST CRIME IN HUMAN HISTORY"
GEOENGINEERING AND BIOENGINEERING: "THE WORST CRIME IN HUMAN HISTORY"
Mr. Carnicom’s work began in 1999 when he noted clear changes in the skies overhead. He has since produced a large body of sound and meticulous yet accessible research reports examining the nature and contents of such aerosols, all of which are available at carnicominstitute.org. 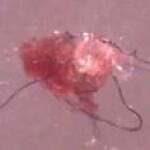 Carnicom also oversees the Morgellons Research Group, a body of concerned citizens, health care professionals, scientific researchers and microbiologists who devote their time to investigating this unfolding syndrome. Along these lines in early 2012 the CDC announced the findings of its inquiry into Morgellons by stating that it could not identify an origin for the fibers and concluding that individuals demonstrably suffering from the condition were “delusional.” Environmental writer Rady Ananda commented that the obfuscation merely provided cover for the Department of Defense’s ongoing experimentation. Republished at GlobalResearch.ca on December 14, 2012.